The days of possibly connecting the charger incorrectly into your charging port are a thing of the past. The new USB C cable can be inserted either way, unlike the previous USB ports. Warning: Use only charging devices and batteries approved by Samsung. Samsung accessories are designed for your device to maximize battery life. Using other accessories may invalidate your warranty and may cause damage. 1. 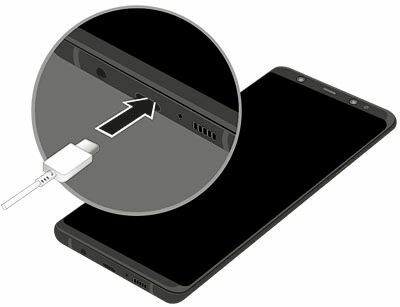 To connect your mobile device to an external device, insert the USB C cable into the USB C port on your mobile device. 2. Connect the other end of the cable into the USB port on the external device. • Adaptive Fast Charging Travel Adapter: For fast charging your device. • USB-A to USB-C Cable: For connecting to a computer, or a travel adapter. • Micro-USB Connector: For connecting to your old device, charging head, or a computer. Note: The Micro-USB connector does not support On-the-Go (OTG) devices such as memory sticks, external hard drives, or keyboard and mouse accessories. • USB Connector: For connecting to your old device, USB flash drives, or a computer.